Vaccine ingredient DENIALISM, it seems, is alive and well across the fakestream media. As Natural News correctly reported, one of the many animal-derived ingredients used in vaccines and openly admitted by the CDC is African Green Monkey kidney cells. Apparently, this realization was just too much for the scientifically illiterate media (and wholly dishonest vaccine pushers) who insisted it couldn’t possibly be true. Now, CDC has confirmed the Natural News story to be 100% accurate and true through several documents posted on the CDC website which openly admit that African Green Monkey kidney cells are used in vaccines approved by the CDC for immunizations across America. Here’s the irrefutable proof, which also demonstrates that the mainstream media is pushing fake news about vaccines while Natural News is one of the very few journalism organizations that dares to publish real news about vaccines. As you can see from the screen shots of the document, below, the list of excipient ingredients is “current as of January 6, 2017,” according to the CDC. Note the inclusion of African Green Monkey kidney cells in the list. And note carefully that the entire mainstream media is calling Natural News a liar for accurately citing this CDC document. As you can see form this list, these CDC-approved vaccines are deliberately formulated with all sorts of highly toxic and questionable ingredients, including acetone, a toxic solvent, aluminum, artificial coloring chemicals, human blood components, dextrose (probably from GMO corn), cow blood components and a whole lot more. Are these vaccines made with African Green Monkey kidney cells and aborted human fetal cells really used in the United States? 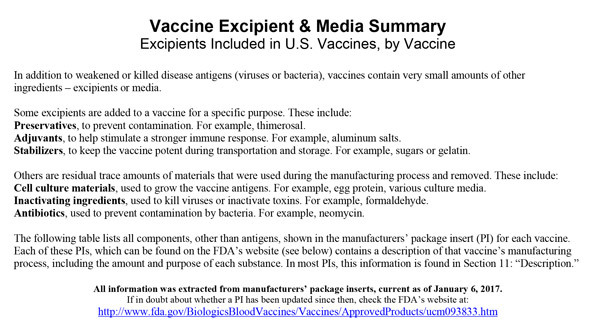 This page from the FDA lists all the vaccines which are “licensed for use in the United States,” and it includes the vaccines containing African Green Monkey kidney cells and the WI-38 aborted human fetal cells. LIVE Smallpox viruses grown in monkey kidneys, then harvested to be injected into YOU! In addition to the CDC confirming Natural News is 100% correct through the documents listed above, the vaccine insert sheet itself also describes the use of African Green Monkey kidney cells. Click the following link for a backup copy on Natural News servers. 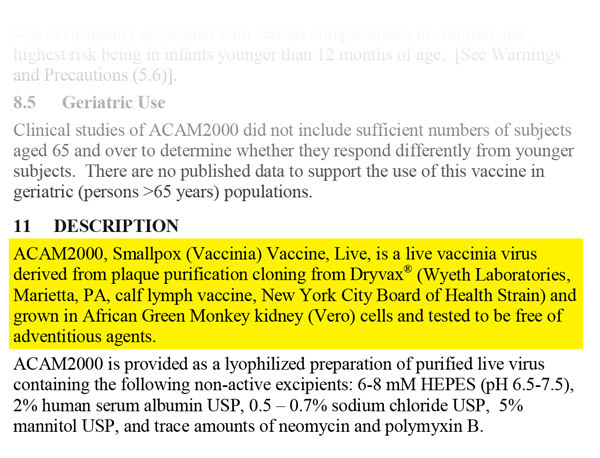 ACAM2000, Smallpox (Vaccinia) Vaccine, Live, is a live vaccinia virus derived from plaque purification cloning from Dryvax® (Wyeth Laboratories, Marietta, PA, calf lymph vaccine, New York City Board of Health Strain) and grown in African Green Monkey kidney (Vero) cells and tested to be free of adventitious agents. ACAM2000 is provided as a lyophilized preparation of purified live virus containing the following non-active excipients: 6-8 mM HEPES (pH 6.5-7.5), 2% human serum albumin USP, 0.5 – 0.7% sodium chloride USP, 5% mannitol USP, and trace amounts of neomycin and polymyxin B.
Myocarditis and pericarditis (suspect cases observed at a rate of 5.7 per 1000 primary vaccinees (95% CI: 1.9-13.3)), encephalitis, encephalomyelitis, encephalopathy, progressive vaccinia, generalized vaccinia, severe vaccinial skin infections, erythema multiforme major (including STEVENS-JOHNSON SYNDROME), eczema vaccinatum resulting in permanent sequelae or death, ocular complications, blindness and fetal death, have occurred following either primary vaccination or revaccination with live vaccinia virus smallpox vaccines. These risks are increased in certain individuals and may result in severe disability, permanent neurological sequelae and/or death [see Warnings and Precautions (5)]. Note the mention of “death” several times, and the shockingly high rate of serious adverse events at 5.7 per 1000 vaccinees. Notice also that this vaccine can cause permanent blindness, spontaneous abortions and severe neurological damage. 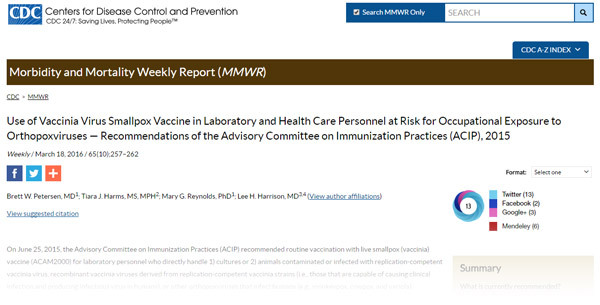 For yet more irrefutable proof of the use of African Green Monkey kidney cells in CDC-approved vaccines, refer to this 2016 science paper published on the CDC.gov website entitled Use of Vaccinia Virus Smallpox Vaccine in Laboratory and Health Care Personnel at Risk for Occupational Exposure to Orthopoxviruses — Recommendations of the Advisory Committee on Immunization Practices (ACIP), 2015. ACAM2000 is a vaccinia virus vaccine derived from a plaque-purified clone of the same New York City Board of Health strain that was used to manufacture Dryvax vaccine. ACAM2000 is grown in African green monkey kidney (Vero) cells and tested to be free of known adventitious agents (4). 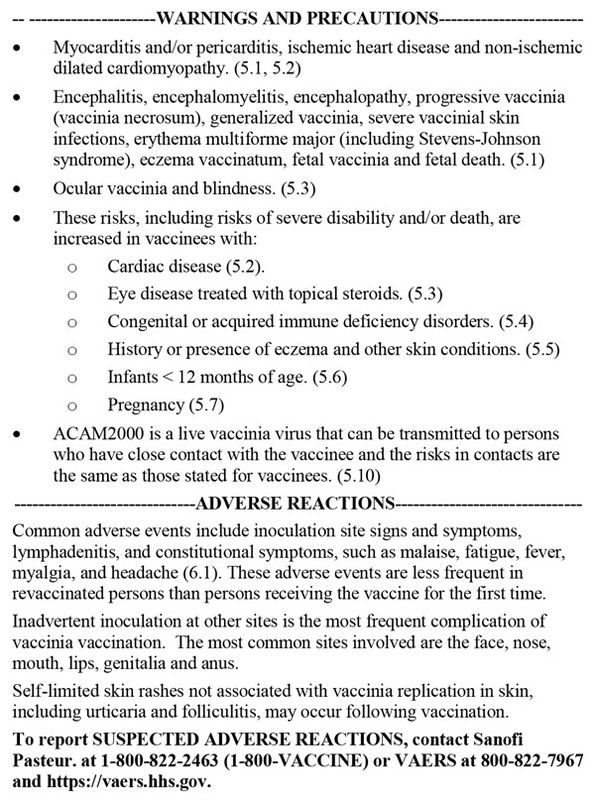 Safety data from ACAM2000 clinical trials indicate a similar safety profile to Dryvax, including a risk for serious adverse events (e.g., progressive vaccinia, postvaccinial encephalitis, and eczema vaccinatum) (5,6). Myopericarditis has also been associated with ACAM2000 and is estimated to occur at a rate of 5.7 per 1,000 primary vaccinees based on clinical trial data (6). #1) CDC excipients sheet from January 6, 2017, documenting the use of African Green Monkey kidney cells in vaccines. #2) The Smallpox ACAM2000 vaccine insert sheet, also openly discussing how live viruses are grown in African Green Monkey kidneys, then harvested for use in vaccines. #3) CDC.gov science paper that further confirms and discusses the use of African Green Monkey kidneys in vaccines. Yet, astonishingly, there isn’t a single corporate-run media outlet in the world that will acknowledge this irrefutable fact. Instead, they attack it and label it “fake news” for the simple reason that they don’t want you to know what’s really in vaccines. It’s clear at this point that the corporate-run media owes Natural News an apology… and they owe their audiences an explanation. More importantly, now that you know about this particular cover-up, you’re also probably smart enough to know that they’re lying to you about everything else related to vaccines, too. Don’t believe a single thing the corporate-run media tells you about vaccines. They are knowingly lying all the time. Stay informed at Vaccines.news and Natural News.